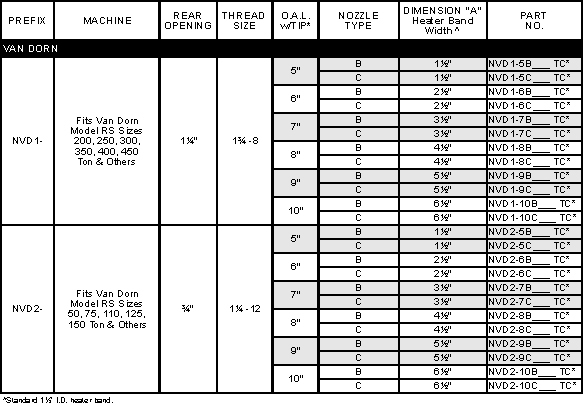 We manufacture nozzles for virtually all makes and models of molding machines, as shown in the list below. Our extensive designer's library consists of hundreds of prints designed for your specific molding machine. In addition to standard designs, we can also custom design nozzles to match your exact specifications. We offer three standard nozzle designs to match your molding needs. Choose from General Purpose, Reverse Taper and Full Taper. All designs are available as a Replaceable Tip Type or Solid Body Type and are available with or without TC holes. Cartridge heated nozzles are also available. *Insert Radius & Orifice: specify 2-digit radius (1/2" or 3/4"), and 2 or 3-digit orifice (3/32", 1/8", 5/32", 1/16", 3/16", 7/32", 1/4", or 9/32"). All prices include thermocouple holes. Van Dorn nozzles are manufactured with one standard 1/8 NPT thermocouple hole. For special TC hole, specify thread size and depth.